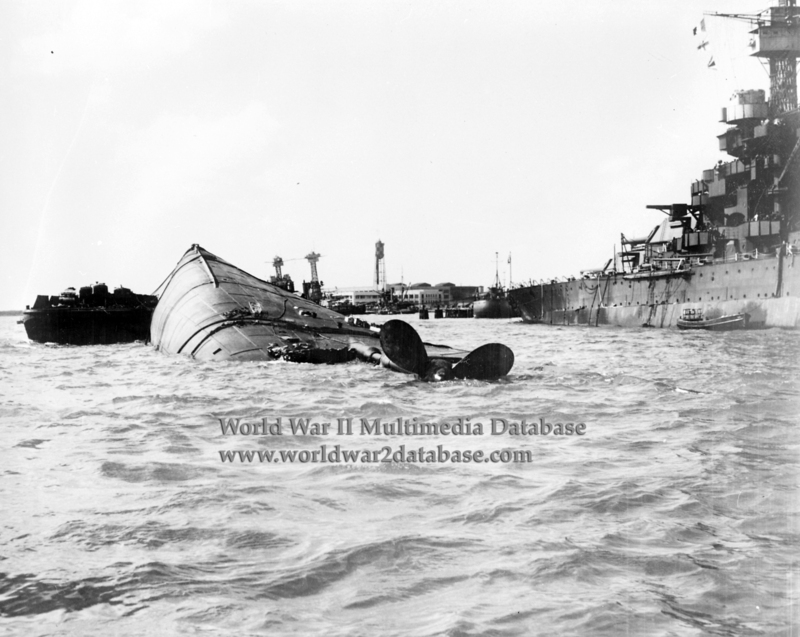 The capsized hull of USS Oklahoma (BB-37), in Berth F-5, with a barge alongside to support rescue efforts, probably on December 8, 1941. USS Maryland (BB-46) is at right, and USS California (BB-44) is in the center distance. As many as nine torpedoes hit Oklahoma, which was the battleship in the direct flight path of the Japanese Nakajima B5N2 torpedo bombers. The first hit Oklahoma at 0756 Hours; she capsized at 0808. While the attack continued, Lieutenant Commander William M. Hobby, Jr. (July 27, 1899 - November 13, 1942) Oklahoma's damage control officer, ascended the overturned hull and began cutting to reach the 436 men trapped inside the hull. Three men swam 90 feet from Compartment D-57 to safety, almost dying in the process. Hobby ordered men to tap on the hull and listen for replies, and soon four areas, frames 22, 78, 116 and 131, reported survivors nearby. Because the oxyacetylene torches couldn't risk cutting into the fuel oil tanks, three openings, one forward, one amidships, and one aft, were made. The crew burned the amidships opening through a fireroom and located two men in an evaporator pump room; to their horror, the men died when the torches used up their remaining oxygen. As fires from the burning ships illuminated their work, Navy and civilian crews cut through the ship all night. The first six men came out of the radio room at 0800 Hours Monday morning. Eleven more came out of the ship's "Lucky Bag," her lost and found. Water came up as the air escaped. At 1400 five more men were freed from an ammunition handling room. That night, several more came out of steering aft. The last men rescued came out from a linen storeroom at 0230 on December 9. There would be no survivors; the remainder drowned or suffocated. Hobby was killed almost a year later, when USS Juneau (CL-52) was torpedoed by IJN I-26 during the First Naval Battle of Guadalcanal. Only ten men survived the eight days at sea to be rescued.